The values expressed in the Scout Law and Promise. A progressive scheme of objectives. Scouting Antiano sees itself as a Social Force; an agent of development, constituting a social force at local, national and international levels. Working together with partners, both private and public, Scouting Antiano responds to the needs of te society. Without social awareness it can not exist. Scouting Antiano is an educational movement for young people, Scouting Antiano is an active member of the society. Scouting Antiano gives a constructive contribution, members of Scouting Antiano contribute daily towards creating a better world, to find ways to be constructive and not to leave society to the care of others, whenever they themselves can be helpful. Every Scout commits to using his / her competencies to help others, to share their knowledge, and to improve community life. Scouting Antiano encourages a Culture of Peace. Open to all, building on a concept of brotherhood is a personal commitment of each Scout and the collective commitment of the association. Contributing to the spirit of peace, Scouting promotes respect for others and the environment, diversity of cultures as well as intercultural, inter religious training. 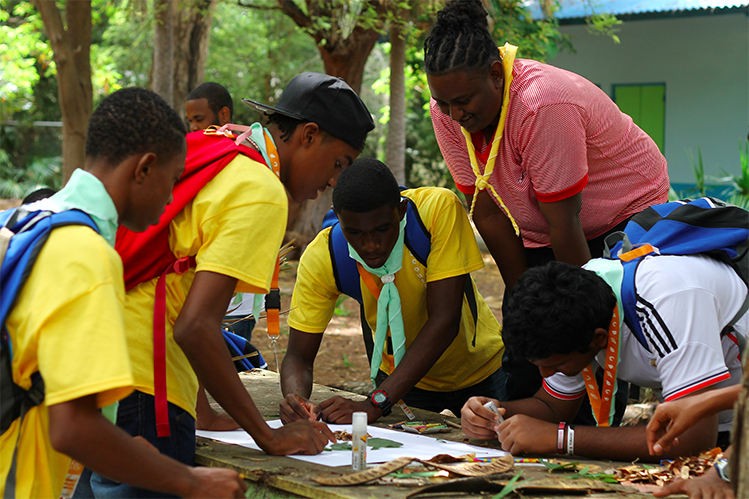 “ By 2025 Scouting Antiano will be the leading educational Youth Movement of Curaçao, enabling 5 thousand young people to be active citizens creating positive change in the community based on shared values”. Is a movement of young people and adults freely and voluntarily committed. Is a non-formal educational movement, complementary to the family, school and religion working towards the holistic development and continuous education of young people. Contributes to the development of the whole person and all people without distinction of gender, origin, race, creed or social background. Educates for freedom and seeks to develop the capacity of thought above the acquisition of knowledge or specific skills. Strengthens in young people the will to opt for a scale of values which gives a direction to their lives and encourage them to live in accordance with that option. Expects its members to live true their faith, to be faithful to the religion of their choice. Believes that the family is the foundation and keystone of the community and center of a civilization based on love, truth and justice. Educates for love, the force capable of creating a stable union between a man and a woman and building a family which forms true individuals. Believes in social justice as fundamental for a humane and sustainable development. Scouting Antiano urges young people to serve the community and to commit themselves to its development as an expression of their concern for others, especially for those poorer and weaker than themselves and those who suffer..
Aspires a community in which young people can grow and fully realize their potential. Fosters loyalty of its members to their country and love for their own land, people and culture, in harmony with the promotion of peace . Stimulates young people’s appreciation of the natural world and their commitment to the integrity of the environment. Favours life in nature as an educational experience and a personal life style. Forms responsible citizens who understand the political dimension of life in society, who play a constructive role in their community and who make their choices guided by the Scout principles. However as an educational movement we hold ourselves apart from the struggle for political power. Encourages young people and adults to share the task of mutual enrichment within a relationship of dialogue understanding and participation. In this special meeting of the generations authority acts in favor of young people’s freedom.